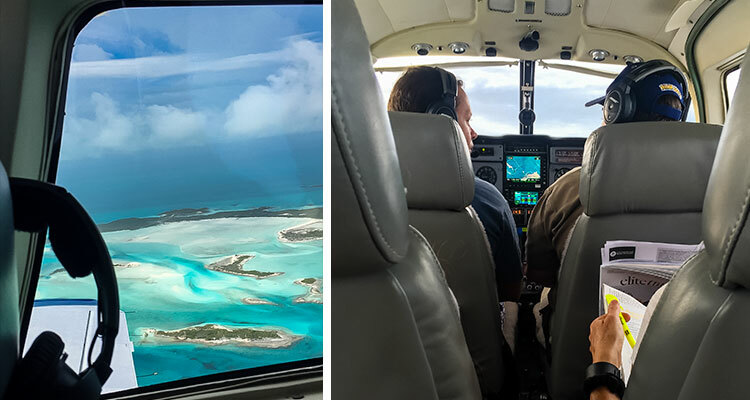 When a friend asks you if you’d like to go on a day trip to the Bahamas in her family’s plane, you say yes. You then proceed to have an incredible adventure!! When I saw the six-seater plane her uncle would be flying us in my heart dropped. I knew it was small, but I’ve ridden in cars bigger than this! I buckled my seatbelt, laughing. If something went wrong I just couldn’t see this piece of fabric making much of a difference. Where’s the aisle? Where’s the woman who’s supposed to tell me where the emergency exit is? I guess, in a plane this small they aren’t hard to find. I realized I’d committed at this point, so with a quick prayer and an “I love you” text to my family, we were off. In such a small plane, we could easily see the town below us–the people, the cars, the houses, the streets and waterways. Then there was nothing but a vast ocean. I couldn’t wait to be exploring it in the Bahamas. 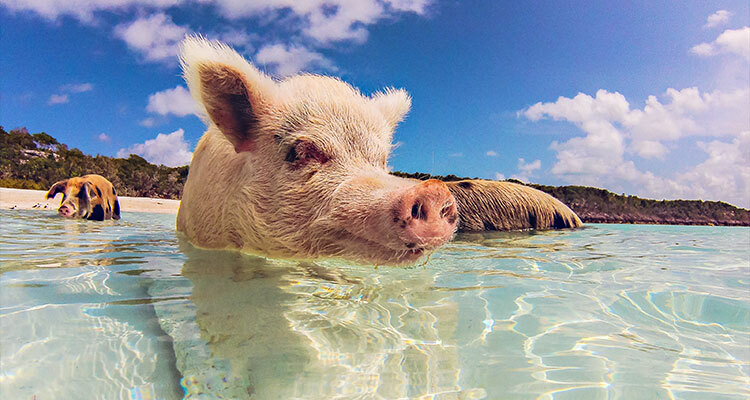 A paradise of swimming pigs, “pet” nurse sharks, and snorkeling adventures awaited us only an hour and a half plane ride away. When we arrived at the airport a pickup truck was waiting to take us to the place where we would rent a Boston whaler (a small, fast boat). We used it to travel all over Exuma’s different cays. Our first stop was Staniel Cay (aka best place ever!!!). 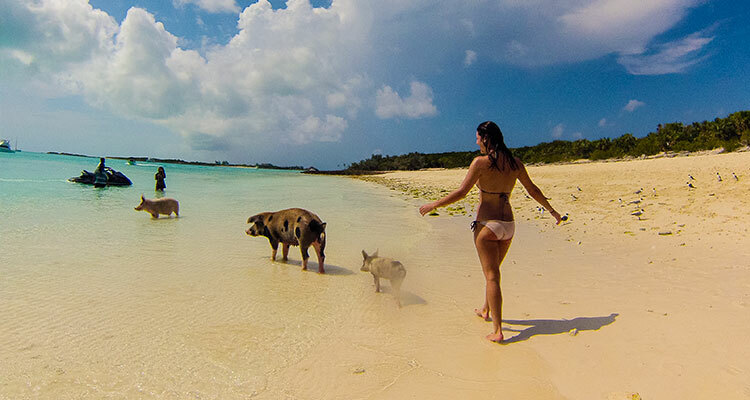 As we approached, giant pigs started to swim — yes, swim — toward us from the beach. Apparently they know to expect food, water, and lots of love when boats arrive. We spent about an hour playing with them, feeding them, and taking pictures. We even got to see three little baby piglets! Isn’t that a nursery rhyme or something? From there we moved on to Compass Cay where I did the craziest thing I’d do all day —swim with sharks. I willingly got into shark infested water and swam around, diving below them to try to get a good GoPro shot, as people threw chum into the water. 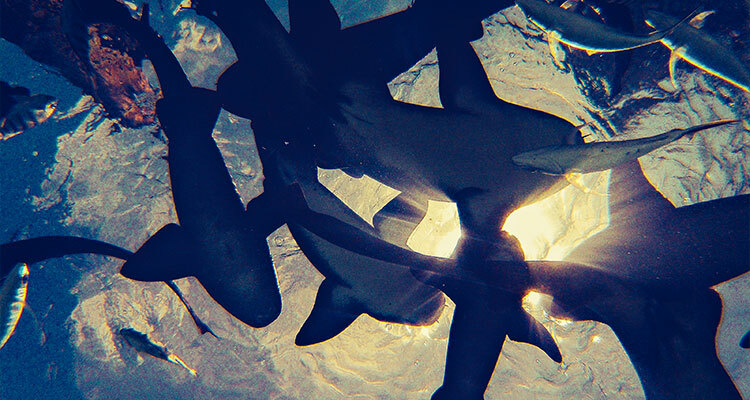 Everyone says nurse sharks won’t bite unless you mess with them. It was a little scary, but totally worth it!!! Definitely a once in a lifetime experience. After the sharks, we boated around to a few more cays, checking out beautiful and secluded beaches. We had entire beaches to ourselves to explore and relax on. Nothing I have ever seen can compare to the powdery white sand and shocking blue of the water in Exuma. Next up was a surprise destination! When we got there it didn’t look like much — just another big mound of rock. As we dove into the water, though, I could see small openings just big enough for someone to swim through. After diving down deep, we found ourselves in a magical cave. I was informed that “magical cave” isn’t actually the technical term, though, so if you go you should probably refer to it as “Thunderball Grotto”, which is also located in Staniel Cay. Light poured in from the holes at the top, and there were several underwater entrances. Hundreds of fish swam around us and the top of the cave was breathtaking with the light and rocks and plants that grew there. We then found out something even more breathtaking. You can climb on top of the grotto and jump in! (Warning: the rocks you have to climb are very sharp. I highly recommend water shoes, we didn’t have any and got a little banged up.) Once at the top, I realized I had learned my lesson from jumping off cliffs in Amalfi. Don’t linger too long, just do it! 1-2-3… JUMP! What a rush! After that we boated around, stopping here and there to see different small beaches and lots of animals. With the crystal blue water, you can see an incredible array of sea life below the surface. While boating we saw some more nurse sharks, sea turtles, tons of fish, sting rays, coral, and of course the piggies. 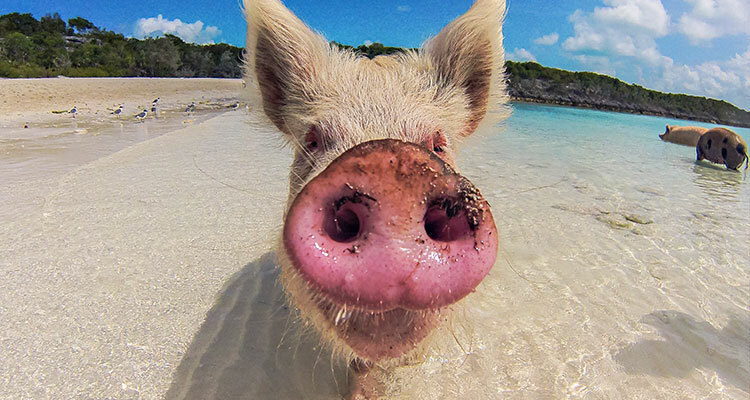 Exuma, Bahamas is an incredible destination that offers everything from adventure to nature and relaxation. Just over an hour plane ride from the continental U.S., you can easily stay for a day or much longer, but don’t say I didn’t warn you: when you get there you won’t want to leave! If you have the time, stay for at least a long weekend. Heck, if you have the time, plan to stay forever! This day reminded me how grateful I am for beautiful places and good friends!